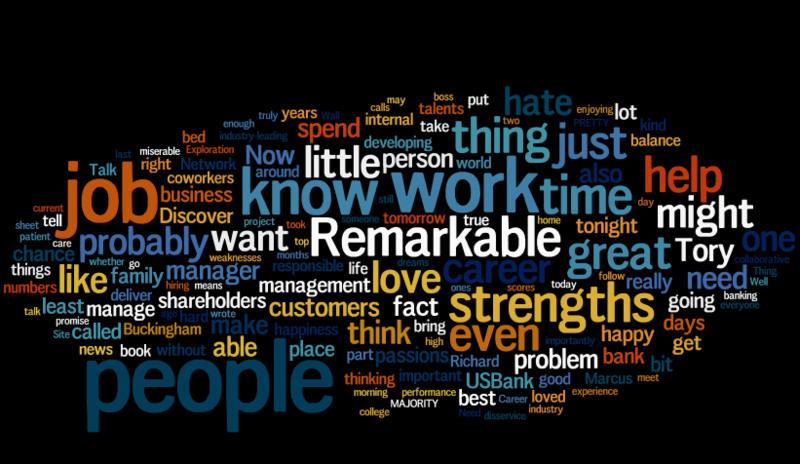 In this season of rebirth, renewal and new beginnings I am reposting one of my most popular posts, Be Remarkable, in a word cloud. Thanks to everyone who has joined me in exploring the intersection of leadership, advice and technology. I started this blog as a creative outlet for me. I did zero market research to determine an audience and have done nothing special to promote it. In just a few short months, it has been read thousands of times in more than 35 countries, and I have discovered scores of bright people making an impact on the world around us. I look forward to our ongoing exploration. This was a speech I gave to coworkers about turning their day to day “jobs” into a rewarding career by connecting to the strengths and passions within themselves. You can read the original post here.